Nomar’s RBI total made him the first Red Sox player to drive in ten teammates since Lynn reached this level on June 18, 1975, in Detroit. Fred Lynn and Garciaparra share the Red Sox’ single game RBI record of ten with Rudy York (1946) and Norm Zauchin (1955). Fred Lynn was a 23-year-old rookie with fewer than 80 major league games under his belt when his 10-RBI game began. He still remembers almost every detail of his record-setting performance against the Tigers. “I had gone hitless the night before and that broke my 20-game hitting streak. I took extra batting practice the next night, and I was ‘in a zone’ the whole game.” Lynn drove in his 10 teammates that evening in Tiger Stadium with a single, a triple, and three home runs. His triple came within two feet of being his fourth home run of the game. “It was quite a night to remember, but the park was less than half-full, and they were all Tigers fans. Nomar was really lucky to do it before the Boston fans in his hometown. When Fred Lynn reported to Winter Haven, Florida, for spring training camp in 1975, he was clearly the Red Sox center fielder of the future. But not even his biggest fan would have dared to predict the kind of rookie season that he would enjoy. All Fred Lynn did in 1975 was to lead the American League in runs, doubles, and slugging average, to field his position spectacularly, and to contribute mightily to the first Red Sox pennant since 1967. His heroics earned him the distinction of becoming the first player in major league history to simultaneously earn his league’s Rookie of the Year award and to be named the Most Valuable Player. Lynn’s blazing start at the plate in 1975 was matched by his acrobatic fielding in center field. Long-time Red Sox fans compared his circus catches to the defensive genius of Jimmy Piersall who patrolled center field with distinction for the Red Sox during the 1950s. He made a tumbling catch on a line drive by the Yankees’ Graig Nettles at a critical juncture in a June game which then Red Sox third base coach Don Zimmer called, “The greatest catch I have ever seen in baseball.” His heroics earned him a slot on the American League All-Star team for the game held that year in Milwaukee’s County Stadium. Fred Lynn maintained the same standard of excellence that earned him All-Star honors over the second half of the 1975 season. Fred Lynn’s strongest memory of the second half happened in center field, not in the batter’s box. The contributions of Lynn and his fellow “Gold Dust Twin”, Jim Rice, together with the accomplishments of the team’s veterans, placed the Red Sox in the American League Championship Series against the defending World Champion Oakland A’s. Sparked by the all-around play of Carl Yastrzemski and the pitching of Luis Tiant, the Red Sox swept the A’s in three straight, earning them a World Series slot against the Cincinnati Reds. Lynn contributed a key two-run double in the first game against Oakland, and batted .364 for the series. The seven-game contest against Cincinnati’s “Big Red Machine” is considered to be one of the most exciting World Series ever played. Joe Morgan and Pete Rose for the Reds, and Carlton Fisk for the Red Sox are the most remembered heroes, but Fred Lynn was a major factor as well. He fielded flawlessly and rapped out seven hits, including a three-run home run that gave the Red Sox an early lead in the epic Game Six at FenwayPark. Fred Lynn fondly recalls his early exposure to major league baseball. “I remember going to a Dodgers game against the Giants when I was about 11 years-old. Sandy Koufax pitched for the Dodgers and I got to see Willie Mays play. I can remember going to games at the old Wrigley Field [the original Angels home field] and the Los Angeles Coliseum when the Dodgers first came to town. Fred clearly made the right choice as he earned All-American honors in his sophomore and junior seasons. Playing under legendary college coach, Rod Dedeaux, Lynn played a key role as the USC Trojans won three straight NCAA national championships. The Red Sox made him their second choice in the 1973 draft, and Lynn made his professional debut in New Britain, Connecticut. He played well in New Britain and was promoted to play in the “Little World Series” with the Red Sox Pawtucket team. He spent most of the 1974 season at Triple A Pawtucket where he batted .282 and hit 21 home runs. His fine all-around play earned him a September call-up to Boston where he batted .419 in 15 games. Fred Lynn’s offensive production fell off in 1976 when he was hobbled by a series of injuries. But he was still voted the starting center fielder in the All-Star Game, held in Philadelphia that year to tie in with the Bicentennial celebration. He managed a home run off of the Mets’ Tom Seaver and he was so excited, “I can’t even remember my feet touching the ground.” He finished the 1976 season with a batting average of .314. Injuries dogged Lynn again in 1977, as they would throughout his career, but he scored a run for the American Leaguers in the mid-season classic held in refurbished Yankee Stadium. In 1978 he earned All-Star honors for the fourth straight time and he managed a single in four at-bats in the game played at San Diego Stadium. 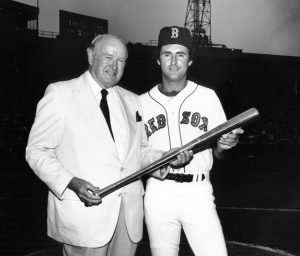 Ask Red Sox fans about Fred Lynn and most will reply, “He had the greatest rookie year in baseball history, but he never reached that level again.” The fact is that Fred Lynn’s offensive production in 1979 exceeded his tremendous rookie output. In 1979 he hit 39 home runs and he led the American League in batting (.333) and in slugging (.637). 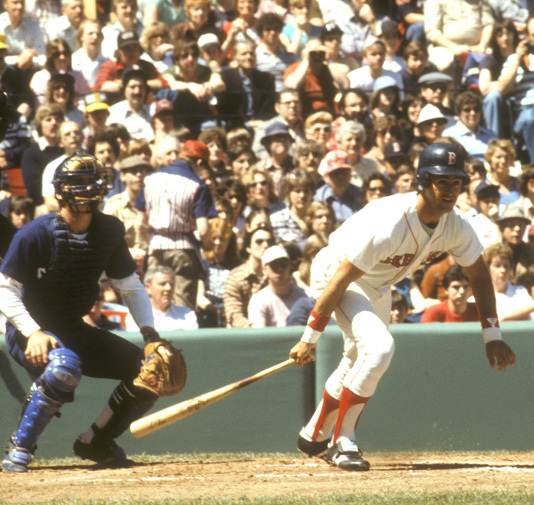 The 1979 All-Star Game featured an all-Red Sox outfield for the American League, with Lynn in center, Jim Rice in left, and Dwight Evans in right field. Fred Lynn ranks that trio as among the best in baseball history. In the 1980 All-Star Game in Dodger Stadium, Lynn connected for his third home run in six All-Star games. His two-run homer off Dodger reliever Bob Welch gave the American League a 2-0 lead, but the National League battled back to a 4-2 win, for their ninth-straight All-Star victory. Following the 1980 season the Red Sox, anticipating some difficulty re-signing him in his free agency year, traded Lynn to the California Angels. The trade sent him back to his native southern California, but it did little to advance Lynn’s baseball career. “I missed Fenway Park. It was an ideal place for me to hit. And I really missed the intensity of the crowds. They used to get me going. I don’t think I appreciated what a great place Boston was for me to play until I left. The fans in Boston stick with the team through thick and thin. They give it to you pretty good when you are losing, but they are there for you. It’s different on the west coast. His offensive numbers fell in 1981, but he retained his All-Star status. He pinch- hit in the 1981 All Star Game at Cleveland’s Memorial Stadium, and he was the starting center fielder in the 1982 game in Montreal, the first All-Star Game played outside of the United States. The 1983 game was the 50th anniversary of the All-Star Game. It was played at old ComiskeyPark in Chicago, the site of the first game in 1933. Coming into the game, the National League boasted 11 straight victories. But the boasting didn’t last long as Fred Lynn broke the game wide open with a grand slam home run in the third inning. He thrust his right hand in the air as the ball landed in the distant bleachers. “I put my hand in the air because I knew we were going to win that game. I hated to lose, and I had played in eight straight losses to those guys. I was sick and tired of losing to them.” Lynn’s home run was the first, and still the only, grand slam in All-Star history. The American League coasted to a 13-3 victory that evening. During his nine All-Star Game appearances, Lynn had compiled a .300 batting average, hit 4 home runs, and driven in 10 runs. This offensive record placed him among the most distinguished players in the history of the All-Star Game. That 1983 game turned out to be Fred Lynn’s last All-Star Game. Following his 1984 season with the Angels, he moved on to the Baltimore Orioles. He hit 23 home runs in each of his three full seasons with the Birds, but injuries limited his playing time. In 1988 he started the season in Baltimore and then he moved on to Detroit where he remained for the 1989 season. Lynn finished his major league career as a National Leaguer, appearing in 90 games for the San Diego Padres in 1990. 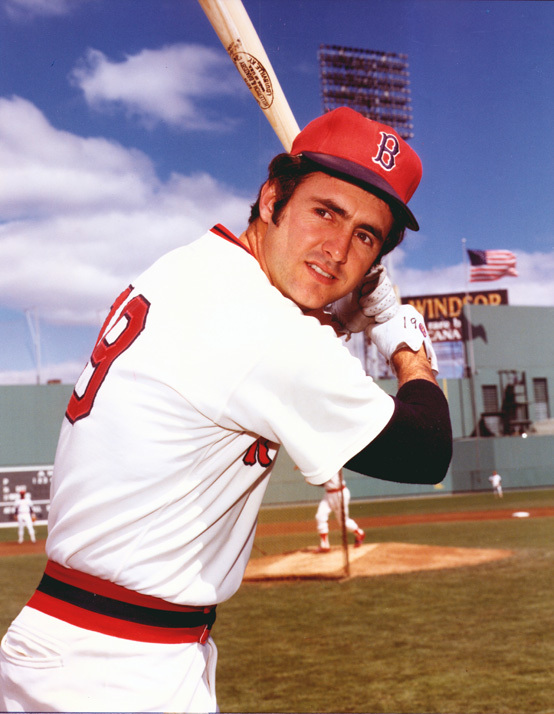 Fred Lynn ended his major league career with over 300 home runs, and nearly 2,000 (1,980) base hits. There is no way to calculate the number of acrobatic catches he made in center field, but he does have four Golden Gloves to show for his fielding prowess. His career may not have reached the pinnacles forecast for him following his amazing rookie year, but it was a very distinguished major league career by any measure. Today Fred Lynn lives in suburban Carlsbad, California, just north of San Diego. He was an announcer for ESPN for four years, and currently he is busy with personal appearances and special broadcasting assignments. His wife, Natalie, is an advertising executive and a Boston native. A return to Boston for the 1999 All-Star Game was a summer highlight for the couple. Lynn had only one more shot at post-season play after 1975. In 1982 he batted .611 in a losing cause as the Angels lost to the Milwaukee Brewers in a five-game series. Fred Lynn was inducted into the Boston Red Sox Hall of Fame in November 2002. He made it clear that a bit of his heart still belonged to the Red Sox. “When you get traded the bonds get severed. You stay in touch a bit, but everything has changed. It’s great to reconnect with the club and come back where my career began. Another great article! It was such a sad time when the Sox let Lynn go. That period saw them give up Lynn, Fisk, and Burleson! What a shame! It still was nice to catch up on Fred Lynn and read his thoughts on his time in Boston and his career. These couple of articles on Red Sox center fielders made me want to see one on Reggie Smith. A Gold Glover and a key to that Impossible Dream team. Great player, classy guy. My favorite Sox player of all time. Fred Lynn was a senior and I was a freshman 1969-1970 at El Monte High School I was the varsity team helper in those days they called us (team manager)we would help out with team equipment and what ever needed to get done throughout the season. I help out and seen Fred Lynn play in all 3 sports (Football, Basketball, Baseball) there were a few other ball players that I knew that were great ball player as well that I will never forget (Bob Davis and the twins Brothers ” John & Mark Fergasons”) Freddie was a picture and took us to the championship he pitched a great. Not only was Freddie a great pitcher he was a great batter!! At our home field out in right field there was a white church I remember one at bat he hit the ball over the right field fence and the church as well. To everyone surprise he got a full ride to USC for football and not baseball. I will never for get Freddie with a silver cap on his front tooth and his high school sweetheart was DeDe Nelson high school cheerleader. Fred Lynn as always be an idol now and back then.